Garage Door Repairs - Did Your Car Hit Your Garage Door? 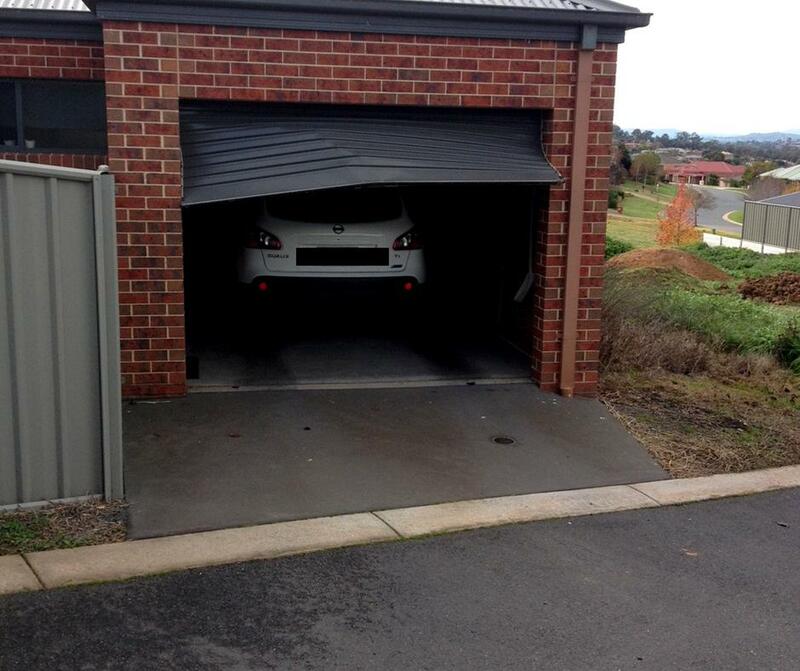 Home You accidentally drove through or reversed into your garage door... what next? You've found yourself in need of garage door repairs when you were least expecting it. You're running late for work and getting the kids to school, when you finally get in the car ready to go and then BANG. In the heat of the moment you hadn't realised you didnt open the garage door and unfortunately you have reveresed your car straight into it. Just as common is the other way - you might have forgotten the handbrake and your car has rolled into the door. These little accidents are nothing to be embarassed about when you make the call for garage door repairs. This type of site visit is much more common than you may think. After ensuring you and your family are safe we strongly recommend to avoid trying to repair the garage door on your own. Depending on impact and the damage occured these types of garage door repairs are best left to our Twin City Roller Doors installers to handle for you. We offer a same day emergency service and we understand you may need to get your car out and keep your garage secure. Call Team Twin City and we will arrange a technician to attend promptly for you. Please ensure you don't let your kids touch the garage door. Read more about kids and garage door safety. Can my garage door be fixed? The repair will depend on the damage and the type of garage door you have. Each situation is different. Sometimes garage door repairs is all you may need, however in some circumstances the garage door may not be able to be fixed. If so, we will arrange a quotaton for replacement for you accordingly. With roller doors as one piece of continous colourbond, we may be able to secure the garage but the door may not be able to be bent back into normal shape where it can roll evenly and smoothly. With panelift doors, or sectional doors, sometimes it is possible to replace the separate panels without replacing the whole door. Emergency garage door repairs that result in a quotation for replacement will all depend on type, model, age of the existing door and some other factors. Depending on the impact and damage this may also impact your garage door motor and this may need to be replaced. The damage may be very small or large. If you are not in need of an emergency repair first, we will organise a free measure and quote for you. Twin City Roller Doors will provide a written quotation for you on the cost of a new replacement door or an extensive repair. A large number of customers choose to make a claim on their house and contents insurance for the replacement. Check with your individual insurance provider for exact procedures and inclusions. Our garage door installers and technicians will put the new door in, either with or without a new garage door motor and remove and take away your old damaged door. Impacted your garage door before? If you have had this happen before its likely the garage door isn't running correctly. Without a proper assessment or service, the door will not run as well as it did prior to being hit. If this is you, please organise a service with our technicians. For any questions on damaged doors please give us a call to talk through your concerns. For replacement ideas, browse through our B&D door options to see what is available to you.